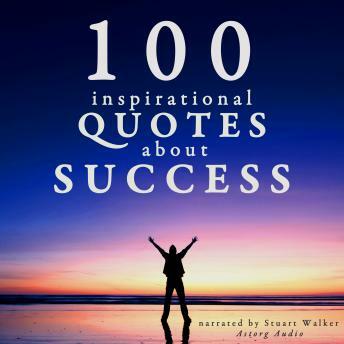 We have selected for you 100 great quotes about success. We all know what success is : the attainment of fame, wealth, or social status. Or the achievement of something desired, planned, or attempted. In fact, success is a very personal thing. What drives one person may be radically different for another. And understanding how others measure or think about success can help you better understand your own definition. The most difficult part to achieve success is to focus on your goals, and to overtake your inner self, to overtake your internal blockings. Those quotes will help you to think, to act, to meditate about success, which is a very important part of that aim. Success is the reward of the hard and smart work that is done by you. Our quotes will help you to be smart and focus. A great quote is very similar to a great thinking and a small poem. It can encapsulate a large web of ideas, thoughts, reflections, emotions in a few words. The reader of a great quote is forced to think about what he just heard. He has to think about those words and what they mean. An excellent quote requires the reader to pause to contemplate the real meaning and poetry of a few words. A great thought reaches a level of universality. Quotes hit hard into the essence of being human. The right quote can help us see some invisible meanings of things or subjects. The range of authors of those 100 quotes about success is very wide: from Mark Twain to Winston Churchill, from Leonardo da Vinci to Albert Einstein, Dale Carnegie, Sun Tzu, Mahatma Gandhi, from Dalai Lama to Henry Ford. Take advantage of the knowledge and the intelligence of all those successful men!